IMPORTANT! This is a detailed review of the properties and potential benefits of Sweet Basil (Ocimum basilicum). It should NOT be confused with Holy Basil (Ocimum tenuiflorum or Ocimum sanctum), also known as Tulsi in Ayurvedic teachings. 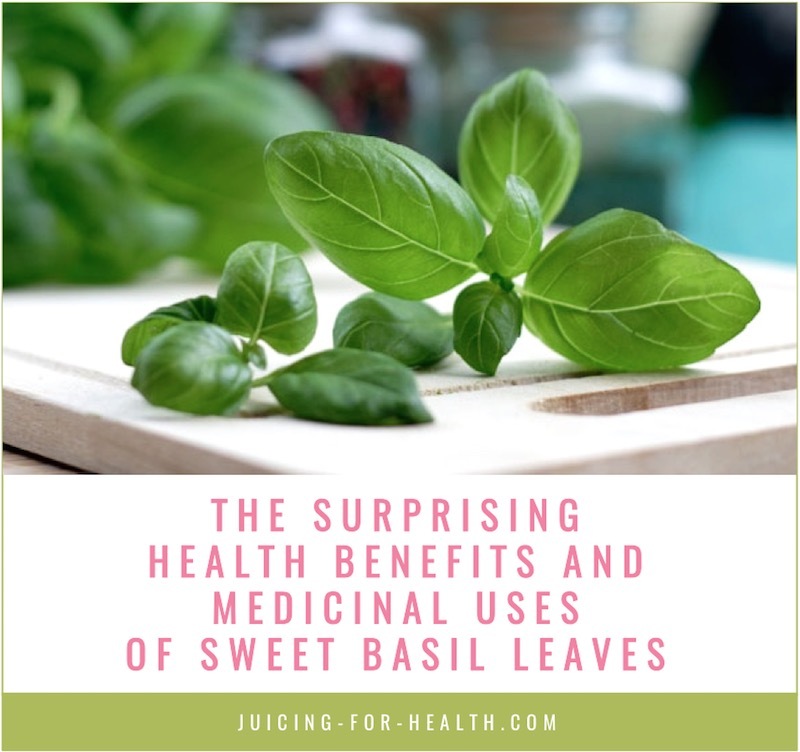 Although these two plants share many aspects in terms of healing, it’s important to mention that the studies and recommendations listed below involve specifically sweet basil. Flavonoids in general, and specifically quercetin, luteolin, apigenin, and kaempferol, show a wide range of beneficial effects including antioxidant activity, antimicrobial properties, and anti-inflammatory potential. Anthocyanins are another group from the flavonoids class, and they are present in higher concentrations in purple and blueish basils. They are known for their anti-cancer properties and their potential ability to improve vision by reducing retinal inflammation. Tannins are water-soluble polyphenols which inhibit the growth of bacteria, fungi, and yeasts. Foods and drinks rich in tannins (herbal teas are a good example) were also confirmed to reduce the incidence of certain cancers, like esophageal cancer. Phenolic acids, such as rosemarinic and chicoric acids, contribute to the antioxidant activity of basil. Linalool is responsible to a great extent for the strong smell and pleasant taste of basil. It also has significant anti-inflammatory properties. Cineole is highly beneficial for the respiratory system since it shows clear mucolytic (makes the mucus in the bronchi more liquid and easier to excrete), bronchodilating, and anti-inflammatory properties. People with chronic obstructive pulmonary disease, as well as acute and chronic bronchitis, are particularly likely to feel the effect of this phytochemical, especially when inhaled (using basil essential oil, for example). First of all, basil has clear stimulant and soothing properties—depending on how you look at it. On the one hand, it invigorates the mind, boosts brain power, enhances memory and empowers learning, as confirmed in animal studies. These effects speak in favor of the stimulant action of great basil. On the other hand, the herb’s soothing properties are fabulous as well. Several studies indicate basil has antidepressant-like properties, significantly helps to reduce anxiety, and even to alleviate the effects of chronic stress. In other words, it seems that sweet basil serves as a balance-restorer for the mind, soothing when needed, invigorating when necessary. Lowers blood pressure almost as well as certain conventional medications: In 2010, a study compared the effect of sweet basil and captopril (a widely used antihypertensive drug) on blood pressure in rats. Starting from a dose of 100 mg/kg daily (the lowest dose in the study), basil was able to reduce systolic and diastolic blood pressure by 20 and 15 mm Hg respectively. The same numbers for captopril were 35 and 22. Elevates the activity of antioxidant enzymes: Sweet basil is able to boost the activity of enzymes in the human body with antioxidative power, of at least three of them: glutathione reductase, superoxide dismutase, and catalase. In other words, besides containing several antioxidant phytochemicals, basil is also able to boost your body’s natural antioxidative reactions! Has anti-diabetic properties: A daily dose of 100 to 200 mg/kg body weight of sweet basil extract was confirmed to reduce fasting blood glucose and improve glucose tolerance. This effect should be controlled carefully when basil is taken along with other glucose-lowering drugs or herbs. May fight obesity and obesity-related hypertension: Basil contains flavonoids such as quercetin, phenolic acids, rutin, caffeic acid. They are able to inhibit enzymes that promote fat digestion and absorption (pancreatic lipase, for instance) and enzymes that lead to the narrowing of blood vessels. Together, this effect may help to control weight and obesity-related blood pressure problems. Soothe stomach cramps and alleviate pain in general: Some studies indicate that sweet basil essential oil is able to effectively reduce stomach cramps and soothe pain, mainly by inhibiting the formation of ”pain molecules” (mediators like prostaglandins and prostacyclin). Has antibacterial action: Thanks to its powerful compounds, sweet basil effectively kills a wide range of bacteria and fungi. Also, studies indicate that sweet basil essential oil is able to boost the effectiveness of standard conventional antibiotics! May help to fight certain types of cancer: More trials are needed to back this up, but laboratory studies suggest that sweet basil essential oil may be effective in killing cervical cancer and laryngeal carcinoma cells. May help in acne treatment: One interesting study from 2012 reported that a formulation based on sweet basil and orange essential oils was fairly effective in treating acne. Basil is loved all around the world for its delicious taste, whether in cooking or just eaten raw. So, the easiest way to have more of this herb in your life is to simply add them in your dishes! Italian cuisine is particularly rich in dishes with basil, such as the legendary pesto sauce, the pizza Margherita, the classic Bolognese lasagna, and dozens of other mouth-watering meals. Indians use both holy basil (tulsi) and sweet basil as culinary herbs, and medicinal herbs in Ayurveda. 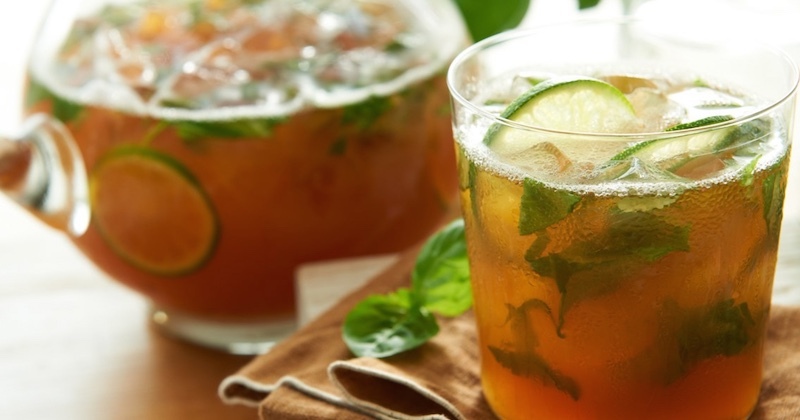 To focus more on the healing properties of the herb, a great way would be to make fresh basil tea. Just pour one cup of boiling water over 2 tablespoons of fresh basil leaves (ground or finely chopped) and steep for 10 to 15 minutes. Add a few slices of lemon or lime to enhance the bioavailability of the nutrients. There are studies indicating that basil is able to reduce fasting blood glucose. Although this is a good effect for most people with diabetes, basil should be taken carefully along with other herbs, plants, and spices that have glucose-lowering effects (such as ginseng, for example) as well as conventional anti-diabetic medications (metformin, glimepiride, sulfonylureas, insulin shots). This advice goes mostly for basil tea since it will contain more of the herb’s active phytochemicals. Take with caution along with antihypertensive drugs or if your blood pressure is naturally low. At the moment, there are no serious studies on the matter of basil toxicity but several minor studies indicate that the herb is safe to take in quite large amounts. In terms of culinary use, it’s likely that basil can be eaten daily for unspecified periods of time without any adverse effects.